This Gildan G280 6oz. Ultra Cotton Jersey Polo Shirt provides all the features of a classic polo shirt for the man who loves simplicity and style. The traditional fit of the polo is enhanced by the soft, moisture-wicking quality of preshrunk, 100% cotton jersey. A clean finished placket with reinforced bottom box makes the shirt look good whether worn loose or tucked in for more professional settings. Contoured welt collar and cuffs add subtle sophistication, but are also practical for keeping your sleeves in place or adjusting the collar for weather and exertion. 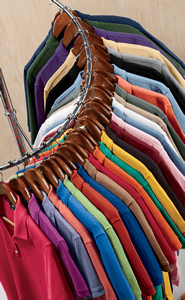 The three wood-toned buttons complement all nine bright color variations of this jersey sport polo shirt. Quarter-turned during the manufacturing process to eliminate center creasing, this shirt is ready to receive your embroidery or logo. When you also consider that this shirt has double needle stitching throughout, you know you are selecting a durable, quality sport polo that will make a great addition to your business casual wardrobe.